BMO World Elite MasterCard - Credit Card Review: The New Travel Card that leaves no competition! If you are worried about the $150/year annual fee, BMO got you covered there. With the annual fee waived in the first year and $300 of sign up travel rewards, you can benefit from this card’s features virtually for FREE for the first three years. Because it is a MasterCard, it can easily replace your Costco CapitalOne card and become your main day-to-day credit card. It is no coincidence that this BMO World Elite MasterCard is the winner of "Best Travel Rewards 2015" - you get 2% in travel rewards on all your purchases. Your vacation plans could become a reality with this Credit Card sooner than you thought, so do not miss out on this opportunity while this special offer lasts. Bank of Montreal’s World Elite Mastercard is becoming increasingly popular. Since it is a Mastercard, it is widely accepted throughout the world. There are three types of cards these days, and each of them caters to a specific need. While one might be good for everyday spending, another offers a tempting bonus for signing up and then there are those that offer additional, elite benefits. BMO has encompassed all three needs in one neat package. When you sign up, you get 30,000 points which equates to $300 in travel value. This is quite the incentive for those who find themselves on the fence about this card. You won’t be liable for any annual fees for the first year. Members enjoy comprehensive travel insurance along with emergency medical care for up to 21 days (for those under the age of 65). Rental car damage, baggage, trip delay and cancellation coverage are all included, and there are no limits to the number of trips each year. VIP Priority Pass membership as well as 4 airport lounge access passes (at more than 700 lounges around the world) which have a value of 200USD. Points do not expire so you can take the time to save up until you have enough to make the vacation of your dreams a reality! For every dollar spent, 2 BMO points are earned. There are no retailer restrictions. 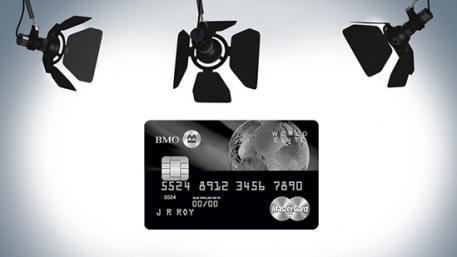 BMO cards can be used to pay taxes and fees on airfare. You can also earn a rate of 2% by doing so. With BMO, you get free, 24/7 concierge services with free dining and entertainment recommendations and reservations. After the first year, cardholders will need to pay an annual fee of $150. The interest rate is 20.5% which is higher than average. Of course, it’s important to remember that cardholders can lower their expenses by paying off what they spend by the end of that payment cycle. When you have a zero balance on any credit card, you always benefit by saving money. Booking rewards points can only be done through the BMO Rewards Centre. Who can benefit from this card? BMO credit cards are great for those who need a card for daily use. These cards make it easy to pay for regular items like groceries and gas. Since points are earned on all purchases (regardless of the retailer), it’s a win-win situation. They are suitable for those who are able to pay off the amount outstanding each month and for anyone looking for travel rewards as well as travel insurance and savings. If you want to redeem points, you need to make sure that your card is at least partially paid off. Of course, you need to be comfortable with the restriction of having to book your travel arrangements through the company’s rewards centre. For those who aren’t really in the market for a vacation, you can use your points for items available from the BMO Rewards catalogue. All things considered, this credit card is great for those looking to buy everyday items while earning travel rewards. So, when you swipe your card for your weekly or monthly groceries, you’re also saving up for that romantic getaway or family trip. When considering any credit card, it’s important to understand all of the terms and conditions as well as how they compare to those of other credit cards. Use our free tool at Wallet Savvy to help you establish exactly which card is right for you!